Trying to get organized this year? Or looking for more modern ways to stay organized? I’ve gotcha covered. I’m sharing my top five free organization apps! Being a technology enthusiast, most of my organization systems are app-based so I can carry them with me and have access to them no matter what device I’m using (I have a Macbook, an iPad, and an iPhone). This one is pretty self-explanatory when it comes to appointments and events. Instead of a paper calendar, I like to use Google Calendar to keep track of appointments. It automatically refreshes, I don’t have to worry about it getting messy from crossing things out, and I can easily add recurring events. I also like to include bill due dates or autodraft due dates as recurring events on my Google Calendar — that way I never forget when things are due or when they’ll be drafted from my account. The best part is that once I’ve paid a bill, I delete it so I won’t pay it again (and partly for the satisfaction of “checking something off”). When I go to delete it, I just select “only this instance” so it won’t be deleted from future months. Google Inbox is quite an acquired taste if you’re used to regular email. Basically, it treats incoming emails as tasks, which can be either taken care of, snoozed to be taken care of later, or trashed. Google Inbox makes it a lot easier to reach inbox zero, because if you’ve read an email and don’t need to reference it again, you mark it as “Done” and it leaves your inbox. When your inbox is empty, the app displays a pleasant sun icon! It also automatically organizes travel plans, purchases, and finance related emails into bundles, so you don’t have to manage tons of labels or folders. Very cool. Get Google Inbox here or in the app store (it’s different than Gmail). 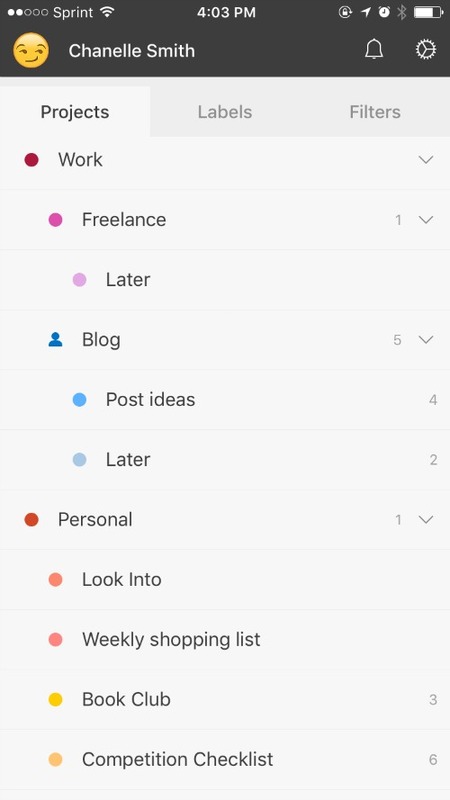 I organize eeeeverything I need to do in Todoist. I have a folder for work with “Blog” and “Freelance” subfolders. I have a personal folder with different lists for my shopping list, books I want to read, a competition prep checklist, and even gift ideas for loved ones. And finally (if you scroll down past the other stuff that’s visible above) I have a folder for workouts. I created five workout tasks and set them all to recur on Sunday. I do it this way because I don’t always do the same workout on the same day of the week, so it doesn’t make sense to assign them to specific days. I check them off as I go, and if I don’t do them all, they’re sitting there nagging me on Sunday so I’ll try harder next week. One of the coolest features of Todoist is that you can use natural language to give due dates to your tasks, like “tomorrow” or “ev month on the 31st”. And if you upgrade to Todoist Premium, you can link it to your Google Calendar and have your tasks appear as calendar events. Get Todoist here or in the app store. 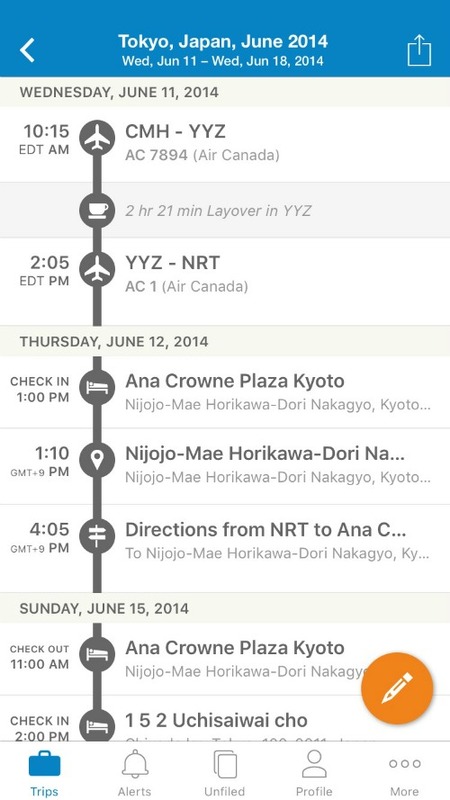 TripIt is indispensable to me when it comes to travel plans. I’ve been using it since 2010! Once you sign up (totally free), all you have to do is simply forward any travel confirmation emails (hotel confirmations, flight itineraries, dinner reservations, etc.) to a special TripIt email address, and it sorts everything out and adds it all to a trip itinerary for you. When you’re on the go, you don’t have to sort through your email to find the confirmation numbers or directions you need because they’re all sitting there waiting for you in TripIt. I can’t emphasize how handy this app is. Get TripIt here or download the TripIt app in your app store. This one’s easy: all you do is sign up for the free smartphone app, and it handles the rest. It automatically logs all your drives so all you have to do is go into the app later and tell it which ones were for business and which were personal. At the end of the year, you can easily export an annual mileage report for your taxes. Get the MileIQ app in your app store. Another great smartphone app that allows you to snap photos of your business receipts, then categorize them. Very simple to use and helps you cut down on messy paper in your office. Get the Wave app in your app store – it’s called Receipts by Wave. I’m always on the hunt for new organization apps to keep myself motivated, so if you have any suggestions, please feel free to drop me a line! There is some great information here. Things I can use to be more organized. Apps are a great way to keep organized! This post was really helpful. Thanks! Thank so the great information I am getting more and more into apps. There are so many tools to choose from, it’s interesting to see how others stay organized. Thanks for posting! My problem with apps is that I am not that familiar with them. However, I plan to get familiar with them because I too could use more organization. These are really great apps to help me get organized. I like that I can use these apps to help me keep organized or everything would be chaos. I find it pretty easy to just jot on my pocket calendar. Whatever works! I don’t use apps to stay organized. I guess I am old school and would rather rely on memory and keeping my brain active for some things. These are such helpful apps to have! I love how technology keeps me more organized! The mileage report for work is very handy. You are a lot more tech savvy than I am. I do use Google Calendar. I have heard of google calendar, but not todolist. I know this app would help me out greatly! I am going to spend 1 lecture on apps for organization. I’ll have to refer back to this. I have others in mind too. I’m teaching a Portfolio class right now.